lol. People hate to be corrected. I was sure nobody could make this stuff up, but I stand corrected. Those innocent yet haughty comments (“Don’t you dare touch my Buddha!”) remind me of the “Cancel my subscription!” letters to the editors of Biblical Archaeology Review. They’re the most amusing part of the magazine, and the reason you tend to head for the letters section as soon as it comes in the mail. Is there negative karma associated with finding amusement in the silliness of other people? If so I’ll surely burn. I saw your book on Netgalley and decided to check out your website. I learned many years ago that the smiling, big belly Buddha depicted in paintings and sculptures was meant to hide the fact that he was in fact emaciated from his choice to abstain from certain foods for long periods of time. Since then, I have always wondered about the quotes attributed to Buddha. 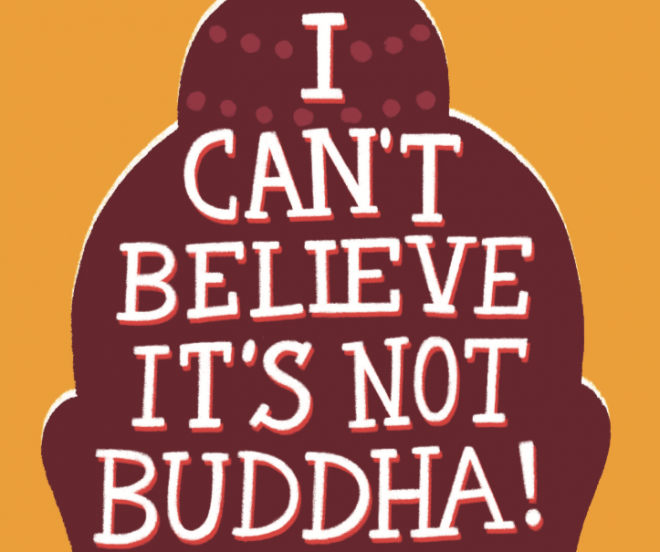 Actually the fat guy is not the Buddha at all, although it’s a common confusion. He’s Hotei or Pu-Tai, who was a Chinese Buddhist monk who carried a cloth sack (that’s what his name means), who loved children, and who is associated with abundance and giving. Westerners confusing the two figures is a bit like a Chinese or Japanese person thinking that Santa Claus is Jesus. Also, the Buddha was only emaciated for a period before his enlightenment, while trying out the ascetic practice of self-starvation, which he rejected, favoring meditation as the path to awakening. What do you mean Santa Claus isn’t Jesus? My childhood is destroyed. Thanks for your great work in going deep in the origins of those fake quotes and the analysis on how it may or may not reflect some truth from the Buddha’s teachings. I know, it’s mind-blowing. I always get these exotic eastern figures confused. Terry Pratchett : “Nothing is really worth doing unless there’s somebody, somewhere, who would much rather you didn’t”. It’s actually quite saddening the number of people who seem personally threatened to find that some piece of verbiage isn’t the Wisdom of the Buddha. These may still be wise (most of them are commonsense platitudes) and most are harmless. So why the fuss? What I notice about most of the fake quotes is that they do not challenge us the way the Buddha’s own (reported) words largely do. Thanks for sharing that Pratchett quote. I love it!